Expatriate in KL: Green Juice for all! 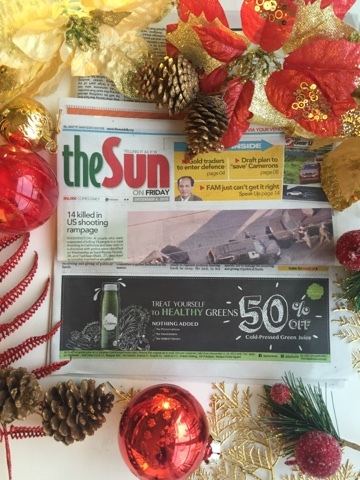 Tweet The Sun Newspaper features La Juiceria Cold-Pressed Green Juice at 50% off via newspaper ad clipping. Malaysians are starting to become healthier as green juices take popularity. The Goodness Greens of La Juiceria is outselling every other flavour. This means people are starting to understand the power of greens. The green juices have more than 70-80% of veggie content while a small amount of fruits , to keep things palatable. Enjoy a green juice today and see the difference it can make to your life!